The weather continues to be warm and pleasant. Water temperatures are in the low 80's. 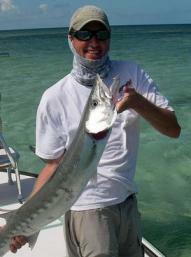 I have not looked for tarpon in week, but fishing has been very good for permit, bonefish and redfish. How ever the big cuda know it is winter time and have started to appear on the flats in decent numbers.. We had a blast cuda fishing today. Cudas can hit a top speed of 35mph,, that is FAST.. They also can make some amazing jumps..